Today we (Chris, John, Adri and I) went to Zeeland to check the QRM level near the Ouddorp lighthouse (it was ok), and I wanted to check the performance of a 80m vertical delta loop. Included are some images. The 1:4 Guanella balun (invented by Gustav Guanella, 1909-1982) was discussed earlier in this blog: link Why this design? I never found an opportunity to test a delta loop in the field, I didn’t have a good antenna for 80 meter, and I never tested my Guanella Balun. 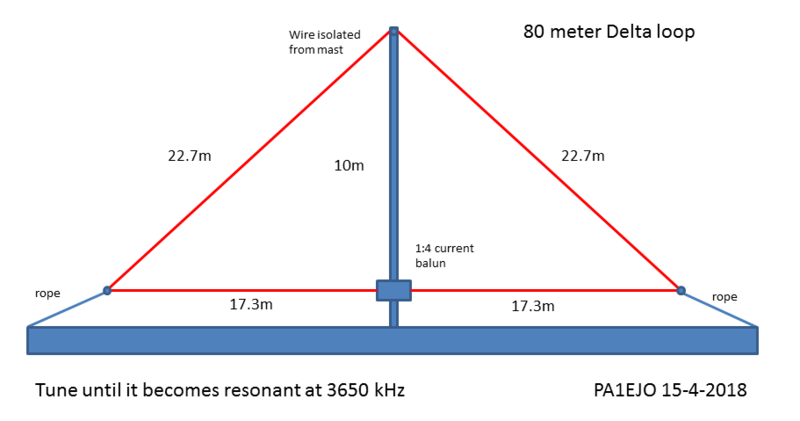 A significant advantage is also that the Delta loop only requires one mast rather than two (or even three) required for the dipole. The radiation pattern of this design is interesting when you put it in NEC, it appears as if all power is radiated upwards and it has a little bit of directivity, so this is an antenna for NVIS (near vertical incidence skywave) activities. During NVIS you stay under the critical frequency which was about 4 MHz during the event. For DX contacts on 80m you need to be there around sunrise and sun-set.